Masters of the Body... the Progenitors, life-shapers of the Technocracy, wage a shadowy war to shape reality for the common good. To this end, they poison foods, create clones, spawn monstrosities and warp both themselves and others, inside and out. 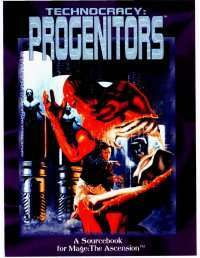 ...Monsters of the Soul Technocracy: progenitors is a Convention sourcebook for Mage: The Ascention covering the hierarchies, methodologies, tools and atctics of the genetic wizards. It includes: An apprentice's journal, following his progress through Progenitor training; New spells, effects and devices for the Progenitors; and A battle roster of Technomancers, agents, and gene-spliced monsters.